Boyish at forty, with shy, sparkling eyes hidden behind his ever-faithful schoolboy glasses and a sweet, fresh smile coiffed with tousled hair, beneath Jean-Marc Luisada’s airs of a bohemian adolescent lies a fire and ice temperament, where exaltation and melancholy, brio and introspection bubble. After being hailed at the Warsaw Chopin competition, followed by an album of Waltzes and Mazurkas that marked his memorable debut in the recording studio with a hint of madness, he quickly took flight. In Japan, the United States, Germany, and Denmark, he chases Chopin like a drug - and his audience shares his addiction. His poetic and fantastical style, with his airy touch and unexpected colors, give him the aura of one of the greats of romantic interpretation. He lays bare Schumann, Brahms, and Liszt. However, this free thinker, a passionate cinephile and music-lover, is not one to let himself be pigeonholed: Granados, Grieg, Dvorak, and Scriabin can stand witness. Refined but never mannered, spontaneous but not overly sentimental, carefully proportioned and in perfect control, his Midas touch seduces us with Bizet, Fauré, and occasional journeys into the major classics for serenity and rejuvenation. 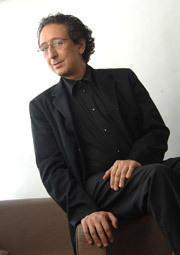 In the land of the classics, Bach, Mozart, and Haydn, as with the others, are given new life; his vision uncovers new, fascinating finds in the treasure troves of this music, as this pianist possesses a perpetually simmering imagination that his previous teachers (Marcel Ciampi, Denyse Riviere, Dominique Merlet, and the great Nikita Magaloff and Paul Badura-Skoda) strove to hone, just as he does today with his own disciples at the Ecole Normale de Musique. He is original without being confrontational -- Jean-Marc Luisada plays for the soul. Sincere, forthright, modest, and always good for a laugh on stage or off, he is a born charmer. One who will win you over despite yourself.